CAP-NATURE PIERREFONDS-OUEST WILL CREATE AND OPTIMIZE TRANSPORT OPTIONS FOR ALL RESIDENTS OF THE REGION. The new neighbourhood has been designed to have minimal impact on car traffic on the West Island and will encourage the extension of the STM network via the Metro system and new bus lines. The new Cap-Nature neighbourhood will occupy a prominent place in the urban environment, conducive to car-pooling, ride-sharing and self-propelled transport such as bicycles. 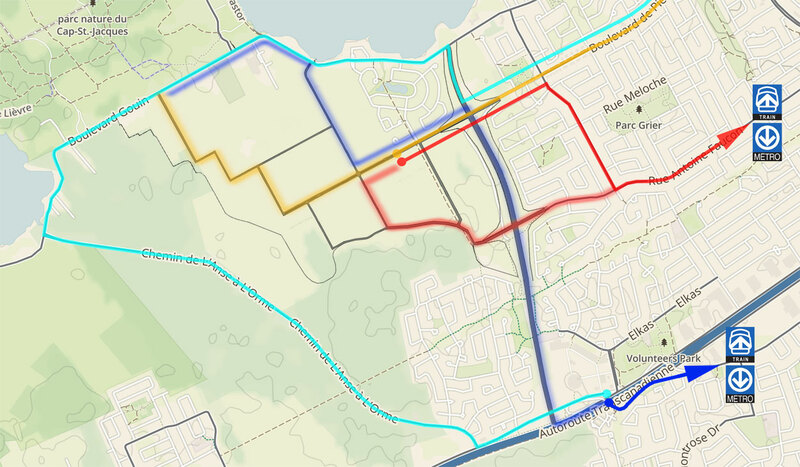 The planned westward extension of Pierrefonds Boulevard and Rue Antoine-Faucon will allow residents east-west access throughout the borough. Better access to the West Island. Pierrefonds-Roxboro residents who currently take eastbound arteries to travel west will reduce their travel time by taking advantage of a new boulevard connecting Gouin Boulevard West to the Highway 40 service roads. The new access alternative will open up Gouin Boulevard West. Proximity to the Kirkland and Sainte-Anne-de-Bellevue commuter train stations created by the Caisse de dépôt et de placement du Québec will ensure rapid transportation to key destinations on the island. Route 470 (by day) and 376 (by night) will lead to the Cote-Vertu Metro from the entrance of the nature reserve via Pierrefonds Boulevard. Route 485 leads to the Pointe-Claire commuter station and the Metro Lionel-Groulx via Boulevard Antoine Faucon and Pierrefonds West. Route 425 leads to the Metro Lionel-Groulx, passing by the Colisée cinema. 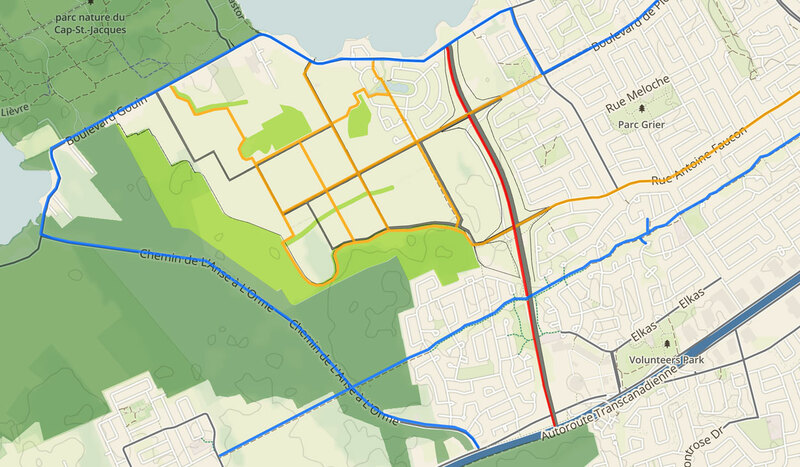 Route 68 provides passage through the nature preserve via Gouin Boulevard West.